Out of the jar, Garland Jack's Squealin' Hot delivers on the promise of heat along with a complex layers of flavors, but some of those come with a bit too much bite. Whew, just as I was about to finish the last of six sauces sent to me by Country Chef two years ago, along comes Garland Jack's, who also sent me another set of six sauces to give a whirl. It may be foolish, but again, I vow to sample each one and give them all a proper review, but first a little background. If you check out the The Garland Jack website, you'll find a fairy tale of a man named Garland Jack having a vision of hogs in the dessert, which is followed up with the statement that Garland Jack is the power of barbecue in all of us. Tall tales and marketing aside, what seems to be the truth is that Garland Jack is a relatively new brand being produced by Kraft. Unlike sauces touting the Kraft name, the Garland Jack series distinguishes itself by forgoing the high fructose corn syrup and using real sugar instead. Garland Jack currently comes in six different varieties. 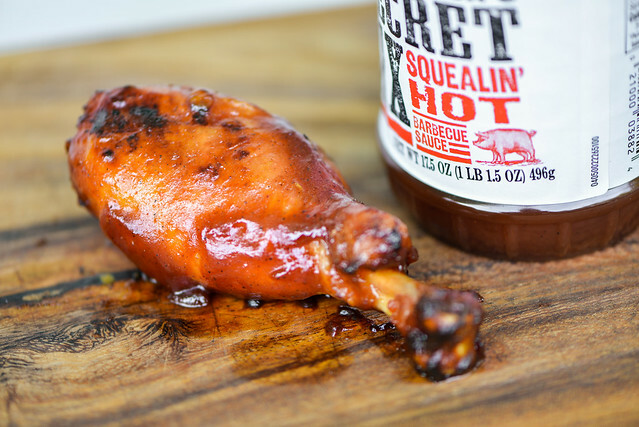 This "Squealin' Hot" barbecue sauce has one heavy handy aroma. It's strong pungent smoky character combines with a sharp tang to make its presence known even from a distance. Get a little closer and its tomato base becomes apparent, giving the sauce a slight fruitiness. There's also a strong molasses component providing the sweetness. There isn't much spiciness to the smell, but it could just be hiding behind all the liquid smoke. 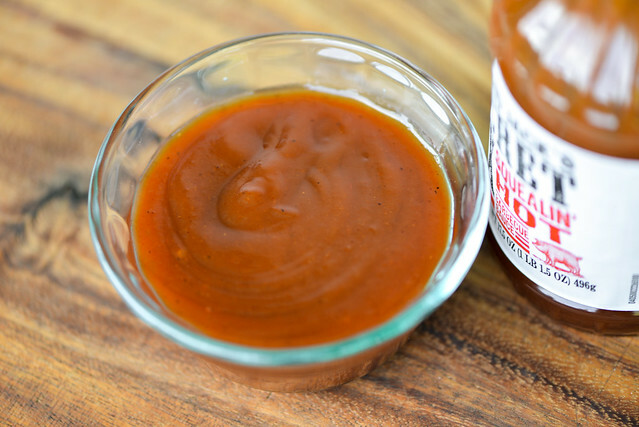 Specks of spices dot this rusty orange, opaque sauce. It has a very smooth texture with a consistency that hits right in the middle of the thickness scale. When dropped from a suspended spoon, the sauce first falls in a large chunk, followed by a few smaller ones, then leaves the spoon coated solidly with sauce. A sugary start gets a little depth by a mellow molasses flavor. Quickly the tang of vinegar comes into play, balancing the initial sweetness. 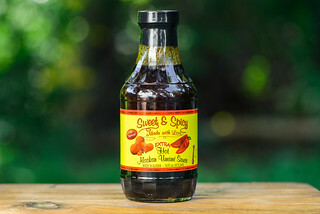 At the same time, the smokiness also comes out, giving the sauce a pungent bite. As the sauce begins to settle on the tongue, a bit of garlic and onion can be detected. It's a fleeting taste though since the heat soon comes in and begins to burn the mouth. As the sauce leaves the tongue, mainly the heat is left lingering, but some smoke and tartness hang around for the after party as well. The sauce coated the chicken nicely and evenly, baking in well over indirect heat and developing just a little caramelization over direct heat. After being cooked, any squealin' the heat produced out of the jar was no where to be found. The sugars took over almost completely, leaving the chicken leg with a mainly sweet flavor that had a mild tang, spiciness, and smokiness. The mellowing of the vinegar and smoke did let the other spices come through—the onion and black pepper were more apparent after being cooked. As supermarket sauces go, Garland Jack's wasn't half bad. I'm a sucker for spicy and it certainly delivered that out of the jar. It also built layers of flavor to make it bit more complex than other common sauces you'd grab off the shelf. Still, the devil is in the details, and I felt those layers of flavor tasted a bit too harsh, especially the liquid smoke which left a pungent and distracting undertone from almost start to finish. 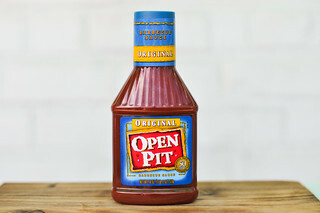 It lacked the fresher flavors I find attractive in my higher rated sauces, making me feel it's a bit over manufactured and uses less than top ingredients. If you're a fan of heat, I would certainly recommend this out of the jar over being cooked, since that nice spice almost vanishes after the sauce is grilled. 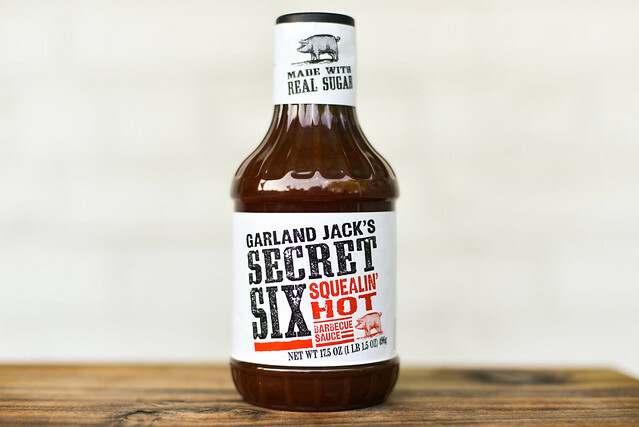 If you want an inexpensive supermarket sauce, you'll likely to find Garland Jack's Secret Six Squealin' Hot a good competitor, just don't think it won't come without some standard drawbacks. It wasn't enough for Garland Jack's to send me six sauces, they also want to send you six as well! To enter for a chance to win the entire line-up of Garland Jack's, leave a comment below on which of the six varieties you'd try first—Original, Hickory Spice, Country Honey, Sweet Brown Sugar, Squealin' Hot, or Sweet 'n Sticky Molasses. Deadline for entries is 11:59pm on Tuesday September 17, 2013. Read the official rules for more details. One entry only per individual. Good luck! Sweet Brown, of course. Ain't nobody got time for anything but!! "Hickory Spice" sounds like a good place to start in my opinion. Being in the middle of the southeast, I would go with Hickory Spice. They all sound great, but I think Hickory Spice would be my pick. The contest has now ended. Congrats to Troy on the win! Thanks! I can't wait to try them. Try em all, their good! But, get em all to Piggly Wiggly in Dothan, Al so everyone can try em all. I stock up on em when I can. I first had Krafts Garland Jacks barbeque sauce original in Virginia while visiting a fellow coworker who had moved there. He was also my favorite golf partner and he loved the Garland Jacks barbeque sauce. I have to admit that the Dinosaur Restaurant's barbeque sauce was my favorite until I had Garland Jacks. 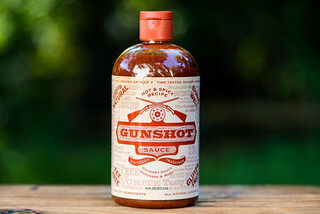 I have been unable to find this sauce in Syracuse, NY, but would love to try the Sweet Brown Sugar or Country Honey.